I’m sorry Kids! I’m so behind! I was all telling myself how I was going to do stuff today like write a post and it turned out to be a big giant lie. I’m not going to do anything today! Kindertrauma Kastle just got a beautiful new gold bar and now I’m going to sit at said bar and drink a cocktail! Do you blame me? My only worry is that one of you fine folks will not have anything to watch today. That idea kills me! 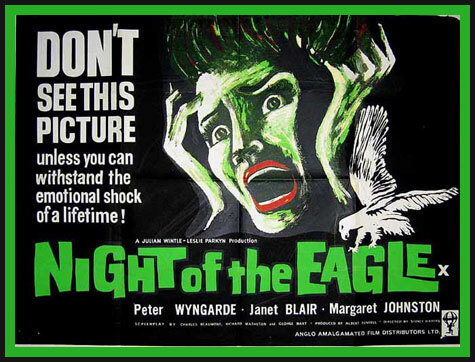 That is why I’m going to suggest that you check out one of my favorites NIGHT OF THE EAGLE/BURN WITCH BURN below! If you’d like to read more about it just jump back to the old review I wrote for it once upon a time when I was less lazy HERE! Cheers!